If you noticed, I used the word THRIVE as a Stay At Home Mom rather than “survive” like you so often see. Why you ask? Because I feel I am doing way more than just “surviving”! For someone who was extremely nervous about being home full time and was confident that it wouldn’t be “for me” or that I wouldn’t be happy doing it, I can honestly, genuinely say it has been one of the best decisions I have made for myself and for my family. At this rate, I might never return to the workforce. Retired at 30…hmm has a nice ring to it, doesn’t it? (Totally kidding… I think). But, in all seriousness, it has been a blessing and I feel very happy, fulfilled and LUCKY to be able to have the opportunity. So, what does my life look like now? I get a lot of questions like this. What do I do all day? What does a normal day consist of? I thought I would put together a list of some things I have done in the last few months that I attribute to why I’m enjoying being home so much. These tips are an accumulation of advice I have received from other SAHM’s, some trial and error on my part, and some things I have read on other blog posts that have stuck with me – so hopefully I can pay it forward a little. 1.Treat staying at home full-time like you would a new job. Although I am technically unemployed in the government’s eyes, I do have a “job”. 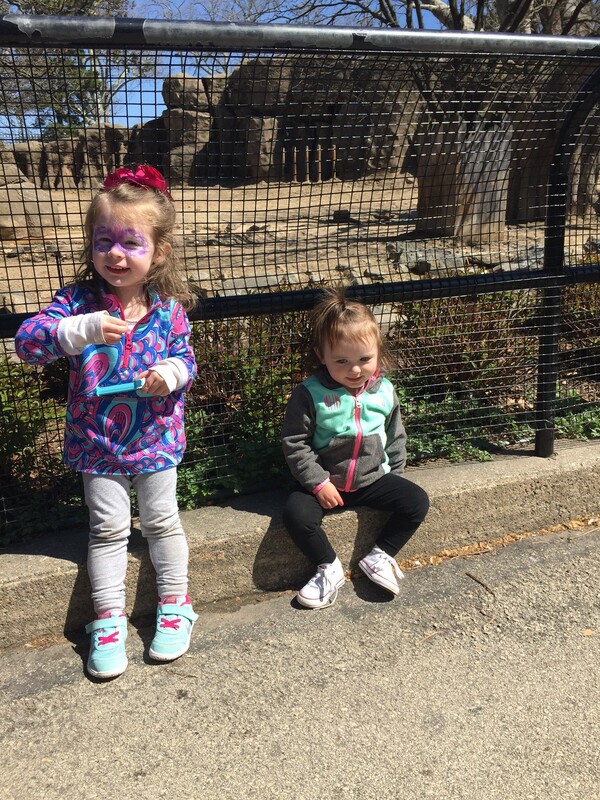 I do not mean in the “raising children is the most important job on earth!” kind of way, but I mean more in a….professional Mom type of way. My job is to care for and stimulate my toddler as well as myself – and yes of course do the housework and yada yada. Despite popular belief, stay at home moms even shower and get dressed every morning! I do not ever feel that I do “less” than my husband or that his job is more important nor does he ever make me feel that way. Remember ladies we also sacrificed a salary when we decided to stay at home. I also feel that I still have a traditional “work week” because my husband works a traditional schedule. My “work” day seems to begin when my husband leaves for work and ends when he gets home and on weekends. Not in a literal sense of course, because we all know the job as a parent never ends and I do not just hand off all parenting duties after 5:30pm… but my husband working a traditional schedule still instills that 40 hour work week routine I was so used to. Don’t be afraid to dabble in amateur photography via artsy Instagram filters and partake in Facebook groups and communities- it’ll make you feel more connected to the outside world and allow you to find opportunities to meet other moms and find activities. I have found so many things to do in the area because of local facebook groups. It helps if you join groups that tailor to your parenting style. For instance in my area, there is a local babywearing chapter/group that meets twice a month, a plethora of breastfeeding organizations/groups, but also things like Hike It Baby where moms post local walks or hikes and all are welcome to attend. All you have to do is search key words that you are interested in. 3. Go to some mom groups! Now that you’ve found some groups you’re into, go to the in person meetings! If group settings aren’t your thing- go long enough to find a few mom friends and make a few connections. Going to the bounce house by yourself gets old- fast. 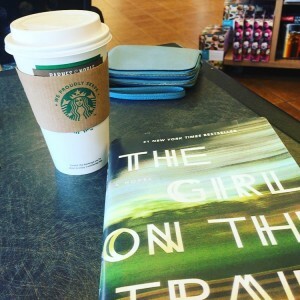 I’m the type of person who needs social interaction – and I have found that a lot of moms who attend support groups, etc. are all looking for the same thing – adult company and friends who can relate to their life space while finding playmates for their little ones. I’ve found that most moms are very open and receptive to making new friends. I couldn’t believe how easy it was! I have made more new friends in the last four months than I have in the entire four years we have been in the suburbs- if only I would have gone sooner! 4. 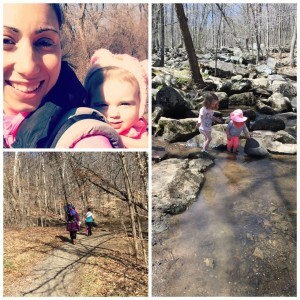 Get to know your area and get outdoors! Get familiar with the local trails, parks and playgrounds as well as indoor activities that cost little money or are free. I have to say, after spending majority of my life in a windowless lab/office it has been life changing to have the ability to be outdoors most days – even in the winter! I hadn’t realized how much I was missing nature until now. It is a privilege that many others do not have so take full advantage of the day light. Not to mention, it’ll do wonders for your overall mood and energy. 5. Become a member of your local library. Public library’s typically have free Mommy and Me classes and not to mention free books and DVD rentals. 6. Embrace being you’re own boss. I have always been so indecisive. But I find myself doing exactly what I want to do when I want to do it and never second guessing the decision or regretting it. Be flexible. Go with it and try to live in the moment. If I wake up and feel like wearing yoga pants all day and not leave the house, then that’s what we do. If I wake up and have the itch to do my hair, put on makeup, and leave for the day then I find something to do and we do it. Take advantage of being your own boss and having no one to answer to – it is a gift! Ahh, you should have known I would bring up good Ol’ Intuition. Going with #6, I also pay attention to my little one’s demeanor. If I feel she’s getting a little antsy and bored and cooped up- I find something to do that will give her some exercise/stimulation/socialization. If she is having a tough day and it is gloomy and rainy and I can just tell being in public will end in meltdowns for both of us, we stay in and veg out. 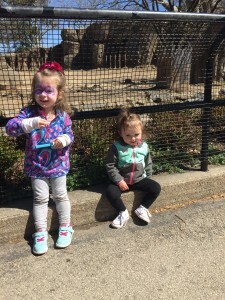 A fun Weekday Zoo trip! 8. Have a few planned activities for the week. Although I still fully support the “go with it” motto, it’s all about balance. It is motivating and nice to have at least one or two days a week where you know you have some place to be (preferably with other moms/adults) and look forward to it. Whether it’s as simple as a play date at a friend’s house or a day trip to the zoo. Once you start to connect with other moms, this will come easy. Remember- everyone’s looking for the same thing! 9. Work around nap times but do not let them dictate your day. Embrace car naps and if you aren’t an avid babywearer-start! If it’s easy to adjust your day around naps, sure go ahead but don’t miss out on things because of a nap schedule. I think our parenting generation has a slight obsession with our infant’s and toddler’s sleep habits. An hour or so later nap is okay; they will sleep- Go with it- your little one will appreciate the aquarium much more than a perfected nap schedule. I am a big fan of car naps to or from an activity or if we are out and about she will nap in my carrier; even at 19 months old. But of course, sticking with #7, if you feel they are really hitting their limit and NEED a nap, just go home (remember you’re the boss!) or push back your plans. Friendly tip: bring a book or something to do in the event your child falls asleep in the car because you will be stuck there – the Kindle App has become my new best friend. 10. Cook! And set meal times. I never really loved cooking all that much and my husband typically handled the meals as he actually enjoyed it (and was better at it) but I found myself twiddling my thumbs that last hour or s o waiting for him to come home. It dragggeddd. Cooking has been a wonderful time filler for this part of the day and adds to my sense of routine/purpose. However, I am no chef. You will not see me looking in the fridge and whipping something up out of thin air. No, no, no; that’s not me. I found a weekly meal planner through Real Simple magazine a while back and it has been amazing. For $1 a month I am e-mailed 5 meals for the week and a shopping list. The meals are typically 30 minutes or less with the more fancy meals thrown in every now and then when you’re feeling adventurous. 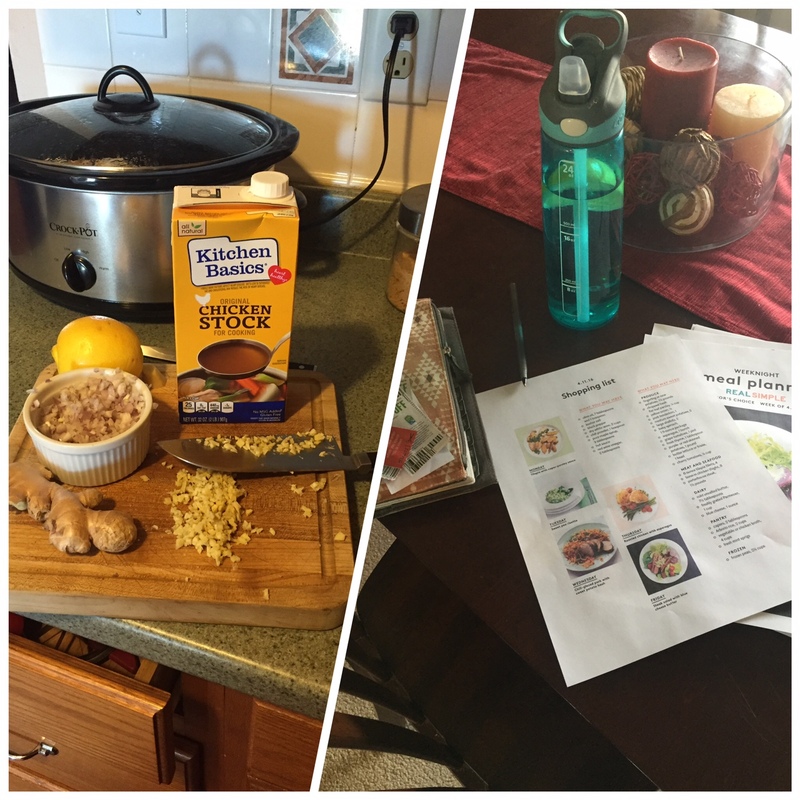 They are easy and healthy, I can’t recommend it enough. When I say “set meal times”, I don’t mean down to the minute but having a typical time we eat breakfast lunch and dinner helps structure our day. 11. Have “special toys” for showers and dinner prep. These are the two times of the day when I really need my little one to be occupied. I have to admit my “special toy” is… the PBS app on the iPad (Gasp! the shame!) but if you are not comfortable with screen time have a special activity that you only bring out during these times. Like favorite blocks or Legos. 12. Turn off the TV sometimes and put on some music! I have the TV off a lot and music playing instead. It motivates me and keeps us both upbeat. Always carry snacks and water for YOU. In the beginning I would leave for the day to run errands or meet for a play date, etc. and before I knew it, it would be hours since I last ate and I would be sick with hunger. I always brought snacks for my toddler but never myself. My hunger would send me to the drive thru window and I did not want to make this a habit for all obvious reasons. I learned quickly that I matter too and now do not leave the house without a water bottle and some healthy snacks that I enjoy for myself. Grapes, granola, and pretzels are easy, or if I know we’re going to be gone all day I’ll pack myself a big salad with some type of protein. But don’t worry, Chik -Fi-La will still get some of our business despite best efforts. Also, do not feel that you’re entire day revolves around your little one(s)’s well-being. Your overall well-being matters too and don’t be afraid to do things you enjoy also. 14. Have some kid friendly crafts up your sleeve for rainy/lazy days. Little minds need stimulation and let’s face it some days you will run out of ideas to occupy them. 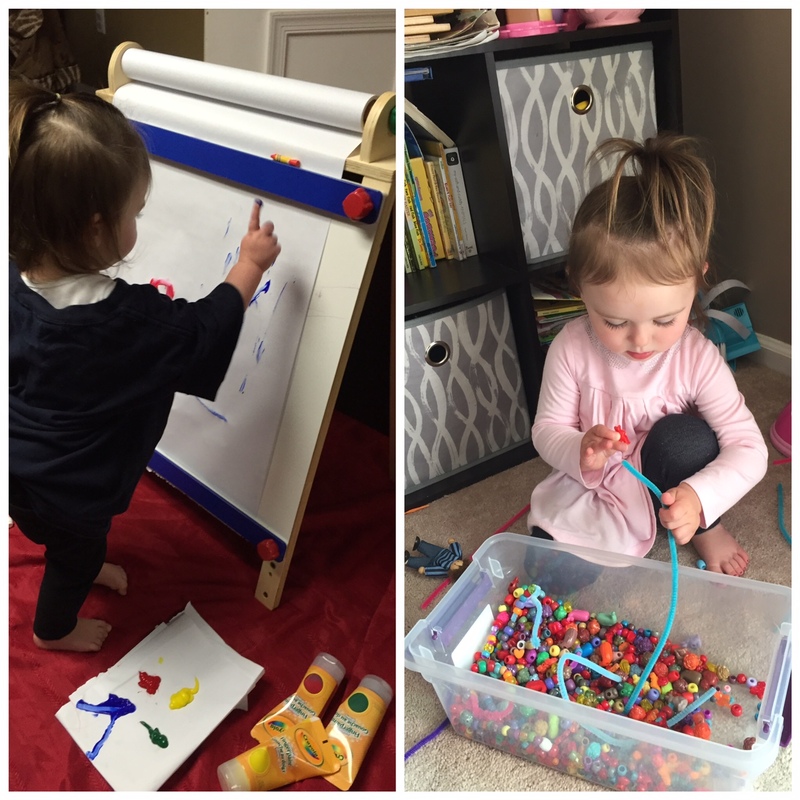 This year “Santa” brought us an easel that we use to finger paint/draw with and I also stole the brilliant idea from my neighbor of the pipe cleaners and beads activity. This simple craft could keep my toddler occupied for hours. Just make sure you are supervising because the beads can be a choking hazard. 15. Find one day time show you like. I love the view. I look forward to watching it when I’m home and when I return from being out all day on DVR. It’s just another thing that structures my day and fills some time and also keeps me in the loop of current events since I miss water cooler talk. 16. Have an outlet that is only for you. Mine happens to be this blog and volunteering in a breastfeeding support organization. Yes, it’s tied to parenting but it really does feel separate. It is something I truly enjoy doing and gives me the mental stimulation and purposefulness I need. Maybe for you it’ll be crafting and opening an Etsy shop or getting some type of certificate- who knows! But think about what you enjoy or are passionate about and pursue it. 17. Get over your fear of public tantrums and nursing in public. I read something a mom posted once that said “I care more about my child’s feelings than I do of what other people think of me “. This has become somewhat of a mantra for me and I can honestly say I rarely get embarrassed anymore. 18. Consider memberships and share them. Most memberships allow guests for free. Check out your local Zoo, YMCA, and museums and share. If you have some local friends, see what memberships they have already and buy a different one so you can take each other. 19. Reward yourself with something at the end of the night or on weekends. It could be a glass of wine with dinner, a workout class, a favorite show, or a trip to Barnes and Noble by yourself to read a book in peace. Some days can be really hard! These things relax me and help me wind down from a day or week of dealing with meltdowns and public tantrums. 20. Don’t fall into the infinite cleaning trap. Straighten up and put toys away once or twice a day at certain times but do not clean ALL day. I like the mornings because I feel a semi- clean house starts my day off on the right foot and I have much more energy then. I do the dishes/clean up the kitchen/put toys away and vacuum. But if I followed my little one around cleaning up every mess she made after that I would literally be cleaning ALL DAY. Nap times if at home are also a great opportunity to accomplish some cleaning- but only if you feel like it! Using this time for yourself is not a crime! Find anything that has worked for you? Leave it in the comments!! This entry was posted in SAHM, stay-at-home-moms. Wendy Williams is always on my schedule so many great ideas!! Thanks for sharing. 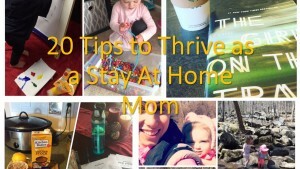 Being a stay at home mom can be lonely so I agree getting out is key.